As a follow up on last week's hero ball post, here is how inequality correlates with shooting efficiency. In that original post, I used Gini coefficients to quantify how equally, or unequally, teams share shot attempts in clutch situations. This season, the Cleveland Cavaliers lead the league in hero ball with Lebron James accounting for 71% of the Cavs shot attempts in "double clutch" situations. But is that necessarily a bad thing? 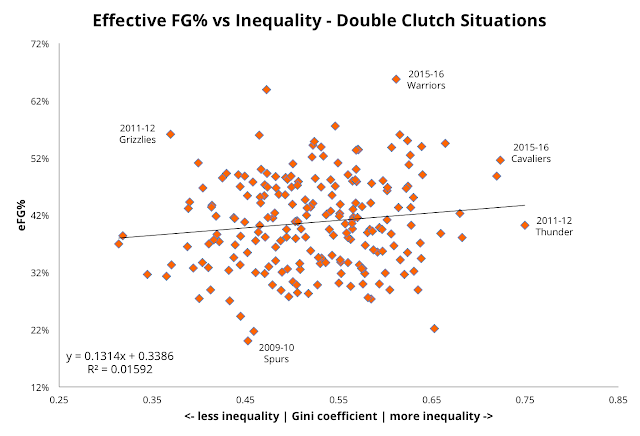 The chart below shows how team shooting efficiency (as measured by effective field goal percentage) correlates with inequality. 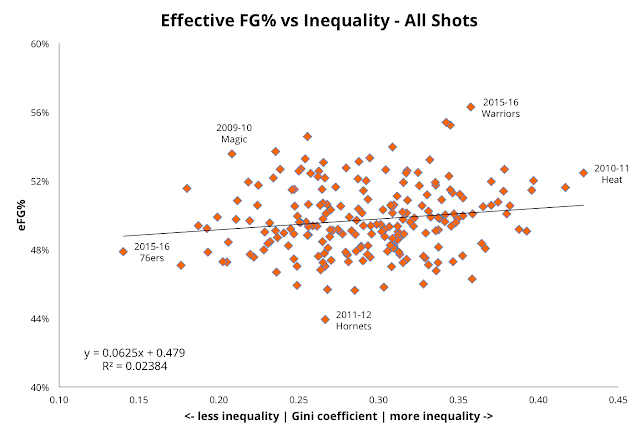 As it turns out, teams with more inequality tend to have better shot efficiency. The Cavaliers this season are shooting 52% eFG in double clutch situations, despite having the second highest hero ball index over the past seven seasons. Lebron is shooting 54.5% on such attempts. This pattern holds for all shots as well. Teams that share shot attempts more equally have lower efficiency. So, should teams forego ball distribution and run their offense through a select few? Probably not, as I imagine that would get causality reversed in this situation. The 2010-11 Miami Heat ran 62% of its shots through just three players, yet achieved an above average 52% eFG. That high level of efficiency has less to do with inequality, and more to do with the fact that those three players happened to be Lebron James, Dwyane Wade, and Chris Bosh. This year's Warriors also rank high in inequality, but it obviously isn't hurting their offense. As FiveThirtyEight's Benjamin Morrison has pointed out, Steph Curry's efficiency is so off-the-charts, he should be taking an even greater share of Golden State's shots. Or put another way, hero ball may not be a bad idea when you have an actual superhero on your team. How long does a rebound take?